Steph Stardust is a Musical Entrepreneur on a Mission. You may have noticed that Steph is not your average DJ. She holds 2 college degrees in Hospitality and Elementary Education. She is passionate about People, Music, Entertainment, and Premier Customer Service. She is dedicated to making your event as Unique as You are — and driven to bring your vision to life and leave your guests begging for "one more song." From her Set Up to the Sound you'll See and Hear the Difference between Royal Beats and other DJs. With a Passion for Music and a Mission to break the mold, Stephanie Stardust has 10+ year’s Experience in the Entertainment Industry. She founded Rockin' Karaoke in 2009, and later launched Royal Beats DJ Services expanding her specialties and services. In a world where good DJs are hard to find—let alone finding one that will play that funky playlist you have in mind—Steph always makes customer service and flexibility her top priority. She brings professional positivity to every gig-- big or small--along with her extensive range of state-of-the-art equipment, cutting edge lighting and sound technology, HUGE music library, and a creative ear that will make you pull the plug on all your preconceived notions of traditional party entertainment. She never fails to engage the crowd, perform with confidence, and put 100% of herself into every gig. S.S. always emphasizes professionalism, positivity, and people skills. When she’s not busy hosting karaoke or making events come to life with music, she loves networking with other entrepreneurs, spending quality time with her family and traveling. 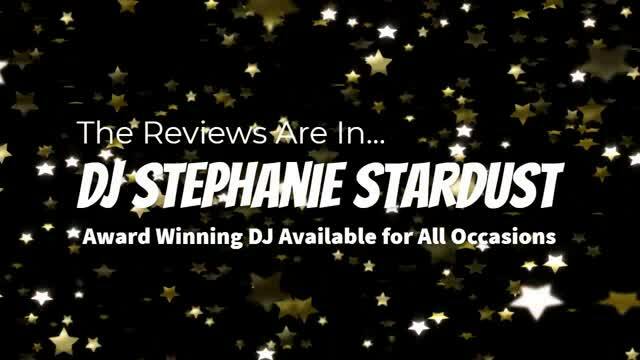 Independent Connecticut DJ Stephanie Stardust has made her own way to go down the path she is going down to establish her career as a DJ and I was finally able to do a short interview with her and ask about her background as a DJ and her plans for the new year. She received the invitation over Facebook messenger and was send a few written questions to answer shortly after. I hope you enjoy the interview! Internet Hollywood: Welcome to the Internet Hollywood universe, Stephanie! I’ve been wanting to include more DJ’s in our monthly discussions for quite some time now, so thank you for taking time out of your day to answer the questions I have written for you. I would like to start off this short interview in our most known way to common readers, so could you give us the background story on who you is, where you from, and what you do? Stephanie: Hello! And thanks for having me!! I’m DJ Stephanie Stardust. I own Royal Beats DJ Services. I am a DJ Singer & Host/MC. Later this year I will celebrate 10 years self-employed!! I’m originally from Bristol but I’ve called Berlin home for almost 10 years now. Internet Hollywoo: Being a DJ would probably seem surprising to a lot of people that may misunderstand the culture or how it’s done. What influenced you to want to become a DJ and how did your peers respond when they found out it was something you were serious about turning into a career? Stephanie: I’ve always been a singer and music lover but never had any intentions to become a DJ. It was totally by chance that my passion became my main source of income. I was working full time at a hotel and had a side gig as a karaoke host. When my job was eliminated due to budget cuts, I quickly made moves to get my own equipment and then everything just happened so fast. The gigs just came to me! I know my Dad was definitely nervous for me at the time but he was self-employed as well so he was not only a great example for me but also supportive. I don’t think my family and friends believed that this job would last as long as it has, or done as well! But, I never let anyone’s feelings about what I was doing get in the way. Internet Hollywood: How hard was it to learn how to use a set of turn tables and what was the experience like DJing your very first party? Stephanie: The first time I took My DJ Controller out I was so scared that I’d break it somehow so I put it back in the box! I had No idea what to do with it! I called my friend and mentor DJ KG and asked for help. When we got together, he laughed at me and basically said he hated controllers. He started showing me how to DJ on his turntables. His skills are so sick!!! I just couldn’t do what he did no matter how hard I tried. I was like a blooper reel. I usually feel technically inclined and naturally good at learning but in this case I just wasn’t! So, he showed me some basics on the controller and from there I went home and learned from tutorials online. DJing my first party was scary and it still can be! I walk into a room full of strangers and hope we all have the best time ever based on the music and atmosphere I provide. It’s not as stressful as it used to be but it can still be challenging!! Internet Hollywood: What kind of functions are you currently doing and what are your rates right now? Stephanie: I’ve never been more excited about the gigs I’ve been booking! Aside from Weddings in amazing locations, schools and private parties, I’ve done ConnectiCon, NH Fashion Week, Charity Events, a Casino Grand Opening, and most recently a Workshop with celebrities in attendance! My rates depend on the event, the location, and # of hours of DJ Services. I also have lights, fog, and a new Selfie Booth available so it depends what you’re interested in! I’m not the least expensive – but I’m not the most expensive. You’ll find my rates somewhere in the middle. Internet Hollywood: Where did you get the name “Stardust” and what made you add it to your name? Stephanie: For years, I had no DJ name. I tried out a few but none of them stuck. One day I’m browsing the craigslist ads and I come across one about saving the world. Don’t ask me why, but I got curious and called. This led me to a bookstore where a book was left for me under the name Stephanie Stardust. He didn’t have my last name so he chose that I guess. Once I heard the name, I loved it and I took it!! Some drama ensued after but I’ll skip that part! Internet Hollywood: Last question; what are some of the things you got coming up and if anyone wanted to get in touch with you how would they do it? Stephanie: I’m excited about DJing the Liquid Lounge Event at the CT Science Center in March as well as the Near & Far Aid Gala Charity Event at Mitchell’s in Westport. I will be returning to NH Fashion Week again in April! I’ve got a few weekly karaoke shows still and I’m honored to DJ more weddings and private parties throughout the year. I can be reached fastest by phone. Call me – it’s the easiest way to get you a quote! Otherwise, text, email, Instagram & Facebook are all ok with me! @royalbeatsdjs on fb and @djstephaniestardust on Instagram [email protected] / (860) 836-0140. Internet Hollywood: Thank you so much for the interview, Stephanie!